thoroughly. Don’t pack the brown sugar into the measuring cup, let it stay loose just as it comes out of the box. Then add 1 pint of heavy whipping cream, 1 pint of half and half, 1/4 tsp salt and 2 1/2 tablespoons of real vanilla extract. For the very best results (who wants anything less? 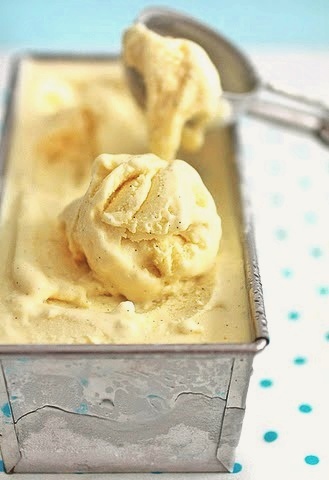 ), let the mix chill in the refrigerator for about four hours which allows the mix to "age" before freezing according to the directions with your ice cream freezer..
*If you are concerned about the possibility of Salmonella from uncooked eggs, substitute an equivalent amount of Egg Beaters.